Polaris 280 vs 380 vs 3900 Sport – What is the best pool cleaner 2019? You will agree with me that Polaris is a household name when it comes to pool cleaners; Polaris 280 and 380 being the most dominant models. But even before the two have humble time to square it off, we have a new and very much hyped Sports model, the Polaris 3900. With 3 Polaris pressure side cleaners in mind, it is important to know how they compare so that you may make the best purchase decision. Having used all the three extensively, I decided to put them head-on and today, I’m happy to present to you my Polaris comparison review. But just before we go deep into the details, a quick overview of these 3 pool cleaners will make sure we’re all on the same page. That said, let’s get down to business. 7 Polaris 280 vs 380 vs 3900 Sport – how do they compare? 8 What is the best Polaris Side Pressure Cleaner? 8.1 Which Polaris cleaner do I have? 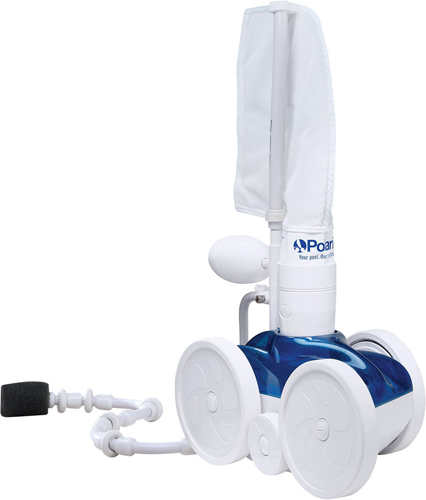 If you are on a budget and you want a high-performance pressure side pool cleaner, get the Polaris 280. Retailing at around $450, it boasts much of the features that the more expensive Polaris 380 has and is equally effective and durable. But remember, this is the base model in the Polaris pressure pool cleaners line so don’t expect it to have the latest features. But still, it packs quite some good features that will make sure your in-ground pool water is clean always. I bought the Polaris 280 in 2015 and it used to do a great job on my in-ground pool. But remember, this cleaner requires a booster pump that you buy separately so when budgeting, include around $250 for the pump. After 8 months of excellent service, I traded it and got the bigger Polaris 380 and there are a few things the Polaris 280 would make you want it more. First, it is cheaper and the maintenance requirements are minimal. It was also able to capture much larger debris and actually, more than what the 380 holds. But then, the 380 offered so much more and the fact that my newer pool was almost two and a half times larger than the previous one, obviously I needed something bigger. You see, the 280 is ideal for mid-sized pools because of several factors that we’ll later discuss in this review. Before I forget, there is one thing I hated about the 280 – the wheels often got jammed so you have to pull it out and free it. I moved to a new neighborhood in some property that had a larger pool and the environment too suggested that I had to get a more powerful and faster pool cleaner and that’s why I went for the Polaris 380. But oh my, it costs a fortune considering I disposed of the 280 for $270 so I had quite a budget to supplement – at the time, the 380 had a retail price of $650. But then, it offered better and bigger performance and notably, it cleaned faster than the 280. But then, here’s a word of caution – the Polaris 380 has quite a number of extra parts and thus will require intensive maintenance. But anyway, that’s something to expect now that it offers better performance than the junior. Still, with this model, you will require a Polaris booster pump so remember that when doing budgeting. But on a positive side, this pool cleaner has better movement and maneuverability and would cover large pools quite faster considering the navigation mechanism is revised. But then, is it worth the few hundred more dollars. Personally, I wouldn’t say yes fully – it’s very hard to call but then that will be your verdict. Just to point out, you will also come across Polaris 360 and it would be important to know the difference between the two. This is another pool cleaner that’s very similar to the 280 and 380, but the major difference being the feeder pump. While Polaris 280 and 380 will require a booster pump to work, Polaris 360 will work with your existing pool pump so it is a cheaper option if you don’t want to invest in a separate pump. But then, before buying Polaris 360, make sure it is compatible with your pool pump. The Polaris 280, 380 and 360 are so far excellent in cleaning floors and walls but what about slopes? If you’ve ever tried the 280 or 380, you understand that it is mission impossible. The two have been designed to work on flat floors and when the pool floor begins sloping, they become useless. But the 3900 Sport has been designed to work on both flat floors as well as gradual slopes. This is courtesy of a revised drive system and also, newly designed off-road wheels. But besides that, what makes it worth the $750 price tag? Some of the new improvements include a larger bag and a more stable wheel system. But the best highlight is TailSweep Pro, a new extension feature that reduces splashing and boosts cleaning. The good news is that while the 280 and 380 are just compatible with TailSweep Pro, the 3900 comes with one included. But if you bought the earlier version of the Polaris 3900, it is regrettable that you lack several new tweaks that the latest versions come with. While the old version had problems with the drive chain falling off the gears, the latest version has a chain guard. Another thing, the head float is now removable so you don’t have to replace the entire top body when the head float dies. But then, there are a few problems I’ve noticed with the 3900 Sport. One, when the bag is full, the weight makes it want to topple over especially on the slopping areas. Also, emptying the zipper bag is quite hectic because it binds too easily. But all said and done, it is still a great pool cleaner and actually, the best in the category of side pressure pool cleaners. If your pool is just next to the window, you know how much it’s stressing when pool water splashes on them. So, Zodiac came up with a simple solution – TailSweep Pro. This is an advanced sweep hose enhancement that boosts water propulsion to blow out stuck debris form those hard to reach places. Besides this, it prevents pool water from splashing outside of the pool. But how exactly does it work? This equipment is like a long hose with vents that propel water thus increasing flow by 50%. The high-velocity water will then boost the sweeping action. 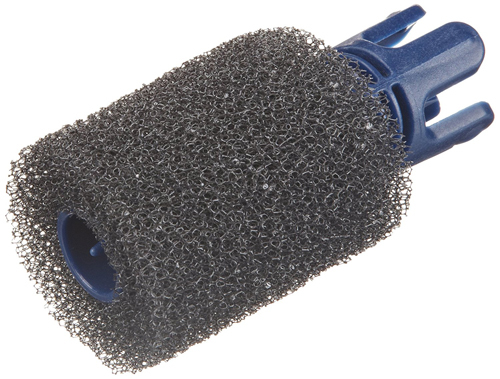 When it comes to preventing splashes, the center diffuser calms and disperses high-pressure streams. TailSweep Pro is compatible with the 280, 360, 380 and also 3900 Sport. But then, not all models come with the equipment included so it raises the question, is a worthy purchase? Personally, I don’t find it a necessary investment if you have a spacious pool and wider side steps. I used it first with the 3900 Sport and trust me, it works magic. If your pool is near the window or you just don’t want pool water to splash around, get a TailSweep Pro or just buy the Zodiac Polaris 3900 Sport (it comes with one included). I know you are wondering what a booster pump does and a burning question lingering in your mind would be, must you have a booster pump? I won’t tell you that it is a must that you have a booster pump but then, it is a requirement for optimum operation. Yes, a Polaris cleaner will still do the job minus a booster pump but then, it won’t put up 20% of the requirement for the task to be complete. That said, without a booster pump, the efficiency is around 20%. But if you want a cleaner that doesn’t require a booster pump, then get the Polaris 360 – it will use the existing pool pump installation. But now that you have the Polaris 280, 380 or the revolutionary 3900 Sports, you will be required to buy a booster pump. So, what’s the best booster pump for Polaris side pressure cleaners? If you did your homework, you know that Polaris has two booster pumps; Polaris PB-4 and Halcyon pump. Though I envy Halcyon because of the quiet operation, I would highly recommend the PB-4 just as the manufacturer does. It retails at around $240 and I’ve used it with all the Polaris cleaners I have. But still, other brands like Hayward still offer several options that can work with Polaris cleaners. Do you really need a booster pump? This is a question everyone asks in a bid to try and cut down costs – so to speak, evading buying the Polaris PB-4. But then, know that in as much as you may have bought the best Polaris side pressure cleaner, Polaris 3900, Sport, you still need to boost its pressure and in that token, let’s look at the advantages of running Polaris cleaner with a booster pump. If you have a dark bottomed pool, Polaris offers equally dark color options known as Black Max models. Though the black color might make you think that they could be more rugged, it’s only the color that’s different – every other thing is still intact. Polaris 280 vs 380 vs 3900 Sport – how do they compare? Now that we know a few things about Polaris side pressure cleaners, it’s time we try to compare them and see which one is the best in which area. 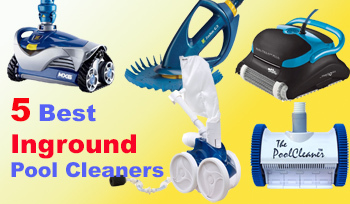 There are several approaches in which we can dissect these three cleaners but to help you get the most out of this review, we will look at them in light of the important factors you will consider when shopping for a side pressure pool cleaners. That said, let’s see how the Polaris battle is squared out. 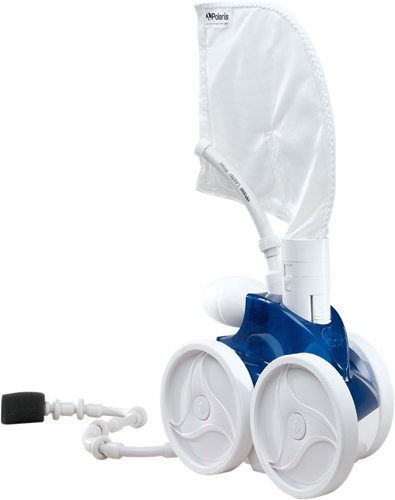 The first thing you would want to consider when shopping for a pool cleaner is, what type of pool cleaner do you want? And then, what is the cleaning priority? That said, let’s look at how the three cleaners battle it out here. If you did your homework, you understand that there are different types of pool cleaners, each offering different features. Consequently, every cleaner will have its pros and cons. 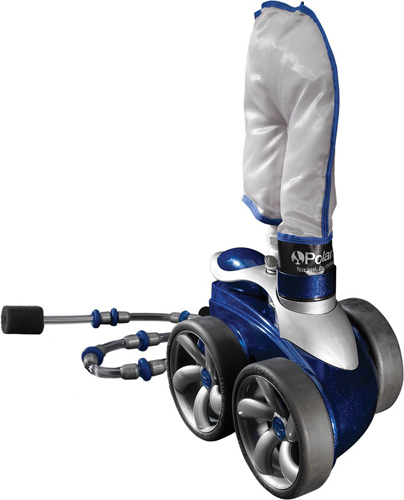 In the market, you will find suction, side pressure, and robotic pool cleaners. For the record, Polaris 280, Polaris 380 and Polaris 3900 Sport are all pressure side cleaners. So how do pressure cleaners work? Ideally, these cleaners attach to the return port of the pool (dedicated cleaner line or pool return). Please note that the three cleaners will require a booster pump to work but if the budget is tight, you can go for the Polaris 360, a special model that will work with your pool pump. That is to say, some pressure side cleaners need booster pumps while other will work with the existing installation. Now, what about cleaning priority? Different pressure side pool cleaner will clean different places. When shopping, make sure that you buy a pool cleaner that cleans all surfaces regardless. Besides, get one that will be comfortable on the pool floor whether it is flat or gradually sloping. One thing I like about Polaris is the versatility. I used to clean the floor and walls with the 280 and 380 and the results were astounding. Also worth mentioning, the 380 can also clean steps but then the performance is not up to the mark. But what if you have a gradually sloping pool floor? This is where the 3900 Sport comes in – it can handle floors, walls and even gradual slopes courtesy of the wide wheels – that’s a story for another day. Having said that, you will want to get the more expensive Polaris 3900 but obviously for a reason – versatility! I know the looks of a pool cleaner are not important in a cleaner but there are some people who are very choosy. The Polaris 280 and Polaris 380 boasts a similar design and aesthetics – only size is the major noticeable difference but on a closer look too, you will realize the 280 has a smaller wheel between the two main large wheels. But generally, they look similar. The same applies to the 360 – wholly resembles the 380 save for a few tweaks because of the pump requirements in the 380. But when it comes to the 3900 Sport, a whole new design is brought on board – bigger, bulkier but more sleek and stylish. I am sure this is what you have been waiting for all this long as cleaning is the primary role of Polaris. Like said earlier, these three pool cleaners are very efficient and will leave your pool clean, free of any leaves and debris. But, is their cleaning performance the same or there is one that is better? Actually, from the varied price ranges, it would be insane if these cleaner offered the same cleaning performance. That said, we obviously expect several variations in features that consequently bring about the varying cleaning performance. So, just how do these pool cleaner rank when it comes to keeping your pool clean? But then, it would be quite a task to discuss cleaning performance in general as there are several aspects that come into play for the pool cleaner to work. That said, we will look at a series of features and compare them to see how they vary in each model and ultimately, how they make a difference in the cleaning performance. Bag capacity– I know for many people, the bag capacity is something you wouldn’t want to gamble with. A good cleaner should have the largest bag so that you don’t have to be emptying it every now and then. The 3900 Sport is the ultimate winner here with a large 5 liters bag. The Polaris 280 also has an impressive size – 3 liters to be precise. Unfortunately for the 380, it has a much lesser bag so if your pool has a lot of debris, it won’t be a great purchase. But notably is the 3900 Sport’s Superbag with a fully zippered access. Besides the large capacity, it has a new Twist Release connection for stress-free detachment when full and easy attachment thereafter. Venturi jets – As you all know, this robot cleaner moves around using the venture effect principle. Basically, the incoming water is converted into a powerful suction current via the jets. The Polaris 280 has only two venture jets and works just fine in an average sized pool. However, the 360, 380 and Polaris 3900 Sport come with three venture jets so definitely, they have more power than the 280. But then you will realize that even though the 380 and 3900 have three jets. The 3900 Sport is still powerful and the reason is the larger vacuum inlet that boosts flow rate. Actually, it delivers around 30% more power and actually not 50% as the manufacturer suggests. Hose – The hose length would be a really important consideration but not with these cleaners. They all come with a 31’ hose, top quality in fact. I’ve only replaced once and it was due to my kids’ carelessness. But the build, material, and durability are unquestionable. Tail Sweep Pro – This is a simple but very efficient add-on that helps to prevent water from splashing out of the pool. The 280, 380 and 3900 have this function but note, only the 3900 Sport comes with one included. Backup valve – Though these cleaners are automatic, and in fact robotic to some level, they are not as intelligent as robotic floor cleaners like the Roombas. You see, Roombas have a navigation system that will guide them all through. But these cleaners lack such a system so getting stuck is a major concern especially if you have a large pool. But the good thing is that the backup valve will pull back the cleaner randomly just in case it is stuck. Though not a really clever solution, it does the job – preventing the Polaris from getting stuck. All the models have this feature so it will be a rare occurrence to find your pool dirty because the cleaner got stuck. Drive system – Like earlier mentioned, among the greatest strengths of the 3900 Sport is the drive system – more advanced and efficient. It features a PosiDrive system driven by a stainless steel chain and you will definitely notice the enhanced power compared to the 380. Though the torque is not 50% more as the manufacturer suggests, this is a pool cleaner you’d want to have if you have a larger pool. It cut the cleaning time by almost 30%. On the other hand, the 360 and 380 have a belt driven system while the 280 is gear-driven. Between the 280 and the 380, I didn’t notice much difference though the belt driven system is best because it requires less maintenance compared to a gear system. That said, the battle remains between the belt-driven system and chain drove system. This is very hard to call as both systems have advantages and disadvantages which in fact, are very relative. What I want you to know is that while the 3900 Sport may have better torque than the 380, it requires intensive maintenance. On the other hand, the 380 will give you average torque and requires very little maintenance – perhaps changing the bets only and periodic servicing. Tires – Though they are not directly related to cleaning, they greatly influence where the cleaner will reach. So far, Zodiac has two types of wheels in these side pressure cleaners; Classic and WideTrax. The 280, 360, and 380 have Classic tires which work just fine but then, stability is compromised, especially when the bag is full. Also, they can’t be used on gradual slopes because of less traction. But Polaris solved all these with the WideTrax tires which in fact, is the reason why it’s called Sport. What I like most about them is that they are bigger – wider and thicker. This gives them enough traction and that’s one of the reasons the 3900 Sport is a favorite for large pools with shallow ends and deep ends – it will remain stable even on the gradual slopes. Before paying for any pool cleaner, first ask yourself, are you getting value for money? Don’t just buy a pool cleaner because you can afford it or just because it is cheap. Do a simple survey, and if possible make a checklist of the features to expect at every price range. This way, you will have a rough idea of what you should expect in a cleaner that is within your budget. Nothing can be as bad as paying for a pool cleaner only to realize that you would have got a better deal at a much lower price. So when shopping, always remember that value for money is paramount! When it comes to our Polaris 280 vs, 380 vs. 3900 comparison review, I wouldn’t say that there is any cheap cleaner. But then, this is a top brand so there’s no way you should expect them to be cheap. But how do they fair on when it comes to value for money? Polaris 280 retails at around $450 and for that price, I wouldn’t say it is cheap or expensive. But when you consider the features, I see value for money. Though it is smaller, it packs the most important features that the 380 has. But then, the bigger model, Polaris 380 is quite expensive and cuts downs some key features. For example, I don’t expect it to have a smaller bag. For $650, I would rather top up $100 and get Polaris 3900 Sport. This one looks like a seriously upgraded model and brings on board a range of new features unlike Polaris 380. That said, I agree that the Polaris 3900 Sport is expensive but then, worth every penny. It will clean floors, walls and gradual slopes while the $650 Polaris 380 will only do floors and walls. What is the best Polaris Side Pressure Cleaner? Polaris 3900 Sport is a hybrid pool cleaner that tries to combine the fancy features of the 280, 380 and 480. And honestly speaking, it has successfully managed to dominate the market, especially with the new upgrades it has undergone over the years. Though it is quite expensive, it is real value for money. Which Polaris cleaner do I have? Many are times pool owners buy the wrong replacement parts. Though there are times retailers send the wrong product, a lot of times it’s because you order for the wrong replacement parts. My wife once ordered replacement parts for the 280 when we had already upgraded to the 380 – I assumed she would figure it out. If you don’t know the model of the Polaris pool cleaner you have, the best way will be to check the serial number found on the back of the cleaner. The first letter of the serial number tells you the model – the 280 starts with C, while K is the 380 and L will be the 360. Definitely, it wouldn’t be a problem to spot the 3900. You won’t miss the extra-large wheels and bulky design. You should also be able to tell the difference between the 280 and the 380 from the wheels; Polaris 280 has three wheels and 380 has two. SHOPPING TIP – Use Amazon’s Pathfinder tool to know if the product you are buying is compatible with your pool cleaner. Many are times your Polaris pool cleaner will malfunction for no good reason. At times it’s worse and the fear of having to buy another one starts to creep in. But in most of such occasions, it might just be a small problem that you can figure out yourself. Having come across dozens and dozens of such situations, I will share with you the common problems your Polaris might encounter and the best troubleshooting tip. So, without wasting more time, here is the Polaris side pressure cleaners troubleshooting guide. I’m sure this is a problem you will encounter and through experience, it can be caused by a number of factors. So, whenever the Polaris is sluggish, and looks moody, here are the areas to check. The first culprit would be the inline strainer, usually installed along the wall fitting – it could be dirty and that’s something that can make the cleaner slower than usual. If the strainer is clean, move to the hose and the first thing I want to say here is, while it may sound clever to use a longer hose, it will drastically cut down power. That said, you will want to use the recommended 31’ hose and if this is what you are using, it will be time to look for answers by examining pressure. The first thing to do here, slowly and carefully examine the entire hose looking for possible leakages. You all know leakages will lower down the water pressure, and consequently, the cleaners speed. Then, move to the cleaner unit itself to ascertain if there is an internal pressure loss. Gently and slightly lift the cleaner and examine the flow rate from the back via the thrust jets. The cleaner should have a solid and steady stream and if it shoots anything between 10ft. and 20ft., it should be fine. So what next? Remove the debris bag and check the height of the venture stream jet – it should hit at least 20ft. If your cleaner doesn’t satisfy any of the two tests, then know there is water loss internally. In most occasions, the problem with water loss is associated with the sweep tail – any holes or missing tips allowed too much water to escape. There was also a rare incident where the sweep tail adjustment screw worked out and got lost – I replaced it and the speed was back to normal. Also, note that there are wall fittings with pressure bleed-off valves to get rid of excess water – opening this valve too much may slow the cleaner. If the pressure is fine- from the hose to the unit itself, then you should shift your focus to the wheels and drive system. Do a spot check on the wheels and remove any debris that may be hindering freewheel motion. Also, make sure they are not jammed internally with small debris like sand and twigs. Try to push them with your hand and feel the ease. Another culprit is the drive system and in most cases here, the parts may be worn out so definitely, performance will dip. Check the drive belt and drive shaft and if need be replace them. There are also some models like the Polaris 180 and Polaris 280 that are known to have weak wheel grooves and teeth that crack or break – this requires replacement. This is a rare but very common problem that Polaris cleaners may experience. Like earlier mentioned, too much hose could be a problem and besides lowering flow rate, it leads to tangling. With a long hose, especially replacements, the different movement directions will loop it more and with the cold temperature and brittleness, it develops a memory of the coil. That said, you will want to remove it from the water and stretch it out in the sun. Another problem would be the swivels – check them out and make sure they are intact and also, make sure the floaters are still floating. I know I said that it’s hard for a Polaris cleaner to get stuck but the truth of the matter is that it is not invincible. The first time I found my 280 stuck I was just expecting the worst but then, the problem was with the backup valve. Remember, the backup valve is responsible for disrupting the flow every 3 minutes to pull out the cleaner when stuck in corners and other areas of the pool. A common fix here would be to unclog the valves – sand and other small debris will block the valves and so, the cleaner won’t be able to pull out when it gets stuck. I experienced the same problem with my Polaris 380 and this time round, everything was fine as far as blockage is concerned. I noticed a small hole on the bottom of the backup valve and upon a short investigation, I found out that it had dragged itself on the floor way too long. Apparently, the hose floats were dysfunctional so it couldn’t stay afloat. There could be a lot of reasons why the Polaris cleaner gets stuck in one place. Remember, this might be different from backup valve malfunctioning in the sense that this time round, there are specific spots where the cleaner gets stuck. One of the areas is the ladder. Yes, you want clean water and safety too for your family but then, with Polaris, you have to sacrifice a few dollars and get a ladder guard. In some tight corners also, you will have to consider brushing them manually to avoid a lot of trouble. Save for the 3900 Sport, this is a common problem with the 280, 360 and 380. There are two reasons that could lead to this – a full bag and defective floaters. That said, you don’t want your cleaner to still be moving around with the bag full. Another thing, check the rear floater and if this is the problem, more often you will find it with water. If this is the case, then know it’s time to get a rear floater replacement. Pressure side cleaner come in very handy if your pool always has leaves, pebbles, acorns and other debris. But then Polaris is the household name here and boasts some of the industry’s leading products. If you want a solid performance, and value for money in general, you should go for such a top brand. You are guaranteed the best in class service, availability of replacement parts and most importantly, reliable and genuine after sales service! Are you looking for a Polaris pressure cleaner but you just don’t know which is which. 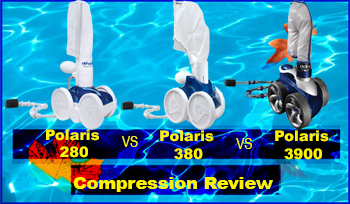 Here is a great Polaris 280 vs. 380 vs. 3900 Sports comparison review and all you need to know about Polaris pool cleaners. ← Dolphin Premier vs. Aquabot Elite vs. Maytronics M500 – What The Best Robot Pool Cleaner?